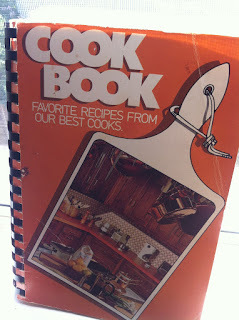 I was going through some old things in the attic recently and came across this gem of a cookbook. It’s one of those school cookbooks where all the teachers, staff and I guess anyone else that wanted to see their name in print, could submit their fave recipes. First up, the kitchen photo on the cover. Since I never saw Carol Brady do any cooking other than to help Alice chop carrots or snap beans, I prefer to call this Alice’s kitchen. They must be making something fancy because they got all their gear out — double boiler, industrial sack-o-flour, wooden salt and pepper shakers, an electric can opener, a coffee press, lemons, onions, a juicer and I’m not sure what the white thing is. Is that a spatula hanging from the pot rack? Why can’t it go in the wooden bowl on the counter with the 76 other rubber spatulas? Does anyone find it a tad disturbing that really big knives are suspended from the pot rack. I bet lots of yummy tuna noodle casseroles with potato chips crushed on top were whipped up in this gourmet palace. 1. Miss Moore — the gym teacher. Lots of salads. 2. Mr. Sisserson — a math whiz with a sweet tooth. 3. The cafeteria ladies — tons of recipes for 150 people. Hey, how can you go wrong with 150 yeast rolls? But the real highlight “Fillings make the Sandwich: How to make 26 new fillings.” Gee, the mom that makes these is swell. Ted, Bobby, Suzy and Sue get in here and try the tasty tongue sandwich I made! And tomorrow night I want to try the Liver Sausage Salad. I think the girls at my bridge club will go wild over it. That and an asparagus jello salad, will make me a shoe-in for the membership chair. Miss Bee said if I ever made her a sandwich with ground ham, crushed pineapple, brown sugar and a sprinkle of cloves she’d first hurl, then move to New Mexico to live with her Aunt. Wow disgust a mondo. What a funny little find. I am with Phoebe on that review! !